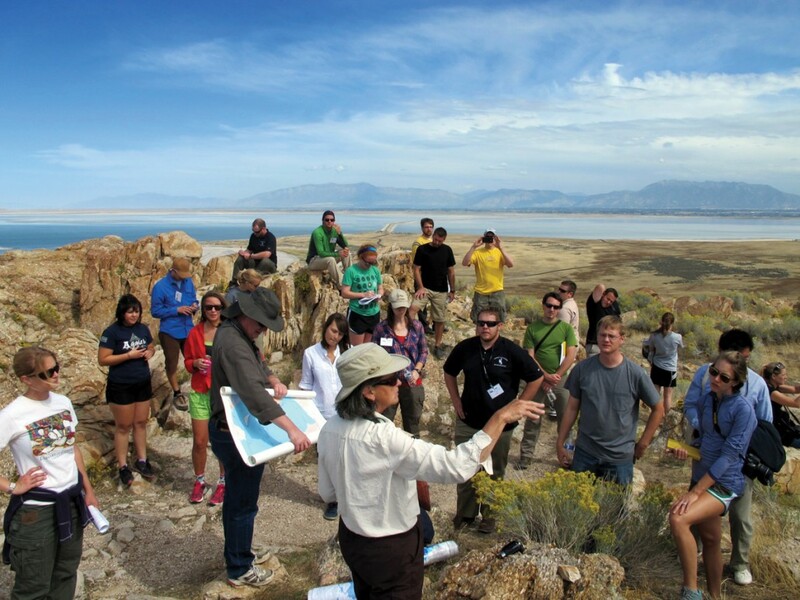 Genevieve Atwood (of Earth Science Education and former director of the UGS) points out features to geology students and young professionals on a pre-convention field trip to Antelope Island. Salt Lake City was the site for the 2013 convention of the Rocky Mountain Section of the American Association of Petroleum Geologists (RMS-AAPG), held September 22–24. 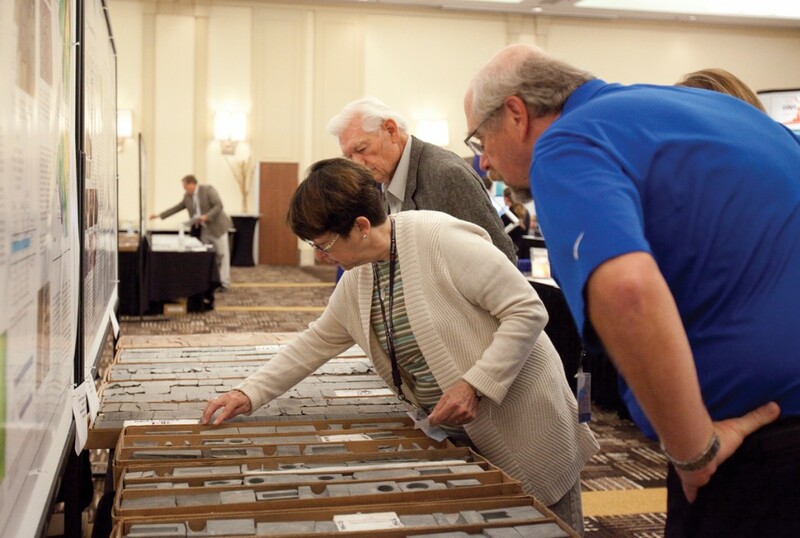 Hosted by the Utah Geological Association, the convention drew nearly 500 professional geologists, geophysicists, and engineers, mostly from the Intermountain West, but from as far away as Canada, Europe, and Asia. In addition, 117 university students participated in the event, significantly more than at previous conventions, and many gave presentations on their graduate or undergraduate research. Several Utah Geological Survey (UGS) personnel were active on the convention’s organizing committee, including Craig Morgan as conference general chairman, Michael Vanden Berg as RMS-AAPG president, and the following chairs: Thomas Chidsey, technical program; Robert Ressetar, exhibits; Stephanie Carney, registration; Paul Inkenbrandt, social events; and Sandy Eldredge, teacher activities. Additional committee members included local university faculty members, consulting geologists, and staff from Utah oil companies. 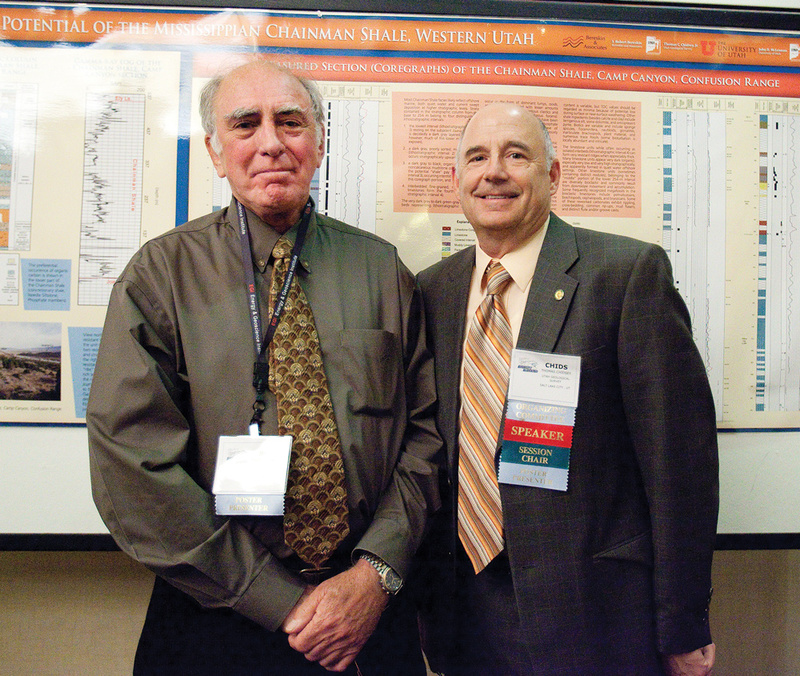 The highlight of the convention was the extensive technical program—participants presented nearly 130 talks and posters featuring the latest in petroleum geology research, geothermal resources, and policy issues related to energy development in the Rocky Mountain region. A common theme in the presentations was the profound recent changes in the petroleum industry, including innovative well completion techniques that are moving historically unconventional hydrocarbon resources into the realm of conventional. However, as petroleum production expands in both new and established areas, peripheral concerns arise involving topics such as air quality, groundwater protection, wildlife conservation, and economic development. These concerns were the subject of a half-day Energy Policy Forum that focused on the potential impacts of expanding hydrocarbon production, particularly in the Uinta Basin of eastern Utah. Unconventional energy sources were prominent in many of the geological presentations. 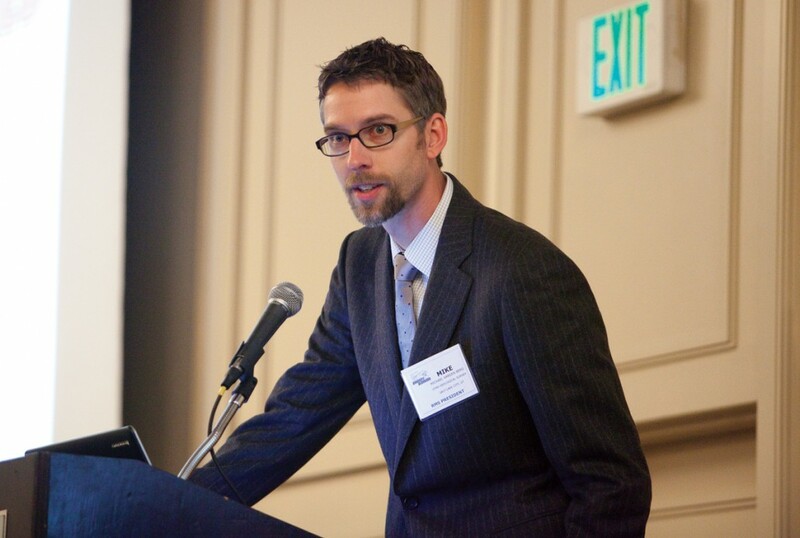 For example, nine presentations, several from UGS geologists, addressed geothermal resources in western states, including newly discovered geothermal potential in Utah’s Black Rock Desert. Nationally, production of natural gas and oil from shale has brought the most significant changes to the energy industry in decades, and this new hydrocarbon source was the topic of several sessions. Researchers from the University of Utah and the UGS gave seven presentations on their joint assessment of the hydrocarbon potential of the Mancos Shale in the Uinta Basin. UGS geologists and their collaborators also described the hydrocarbon potential of Paleozoic shales in the Paradox Basin, the northern San Rafael Swell, and the Basin and Range Province. Another recent development in petroleum geology is the recognition of the significance of microbial carbonate reservoirs. Utah is special in having both modern (in Great Salt Lake) and ancient (in the Uinta Basin’s Green River Formation) examples of this rock, which was the topic of seven presentations as well as a post-meeting core workshop and field trip (see related article on page 1 of this issue of Survey Notes). The All-Convention Luncheon provided a step away from petroleum geology as the featured speaker, Dr. Rebecca Williams of the Planetary Science Institute, presented the latest findings from the Mars rover Curiosity. Even this event maintained a local flavor as many Utah landscapes have served as analogs to geologic features on Mars—see Survey Notes, v. 40, no. 3, p. 1–4. Overall, the conference was a resounding success. Attendees offered many compliments on the technical program, short courses, and field trips, in addition to remarking on the beauty of Salt Lake City and Utah.